It is ideal to Brush after every meal. Use a toothbrush and add fluoride toothpaste. Use circular motions for about 10 seconds on each tooth, making sure the bristles touch every surface of every tooth. Angle the tooth brush so the bristles will go between the tooth and the wires. Brush every tooth slowly. 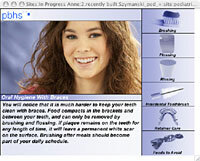 Brush between the braces and the gums. Also brush your tongue and the roof of your mouth.